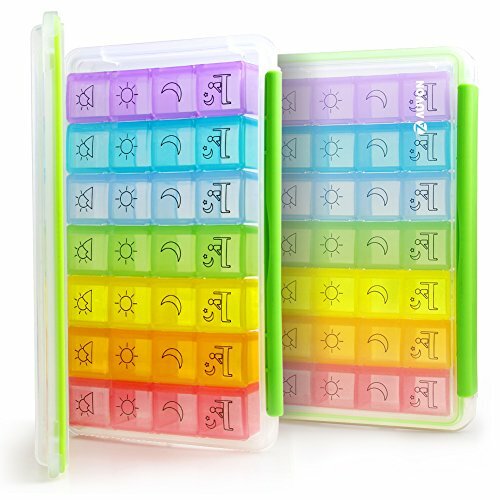 Make your pills or supplement easy to retrieve by getting the weekly pill boxes from AUVON! It is a useful tool for medication management - whether for your kids, parents or grandparents, and even for yourself. Retrieving medicine is simplified by a secure button and also keeping pills is also enhanced by the secure button. Each slot holds a day pack that has four AM/PM large capacity compartments for morning and evening multiple pill regimes. It's great if you don't want to bring multiple bottles when traveling. 1. Set pill box onto a flat surface or hold in hand. 2. Using index finger or thumb, press down onto colored tab. 3. Close compartment lid when finished by push the edge to the lid. 1. Wash prior to first use. 2. After first use, wash with mild soapy water. As with all medication storage devices, keep out of reach of children and pets. Store a Week's Worth of Meds. You can simply orgainze your weekly medication at the beginning of the week and place the organizer on the counter to easily keep track and maintain your AM/PM medication regimen, which is great if you're traveling or on-the-go since you can detach exactly the days you need. Secure Pills from Spilling. No worries about unwanted dumpage of pills found by pets and kids for your slightest unintentional or incidental touch on the pill planer. The push button stays closed once locked and securely snap shut keeping pills safe. Easy to Use. The pill dispenser has a tested design to make it easier for you, especially for the elderly, to open the medicine box; This pill case also has a contoured design on the bottom for easy pill removal; The large compartments are manufactured from a translucent material thereby allowing easy monitoring which box is empty without opening. If you have any questions about this product by AUVON, contact us by completing and submitting the form below. If you are looking for a specif part number, please include it with your message.